It’s now the end of the loverly summer and I am looking forward to riding around in a lot of rain and mud. I’ll be using my winter bikes. My best bike, the black Specialized Roubaix and my second best summer bike, the Orbea are both hung up in the garage. The Specialized might be brought out if it’s a nice day and if I want to go a long distance but these two have pretty much gone into hibernation. Both have Fizik under bar tape padding and a clip to take the Garmin eTrex 20 and Shimano M540 pedals. 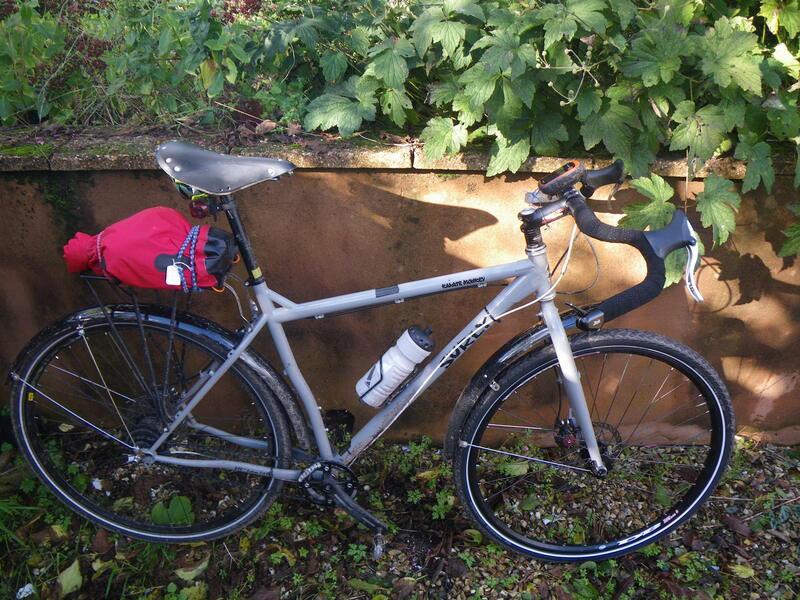 Both have mudguards and racks. But there are many differences…. 2 x 9 speed drive train – the rear is a MTB cassette and dérailleur. The front is 38×48. I tried a 1 x 9 but this suits me better. 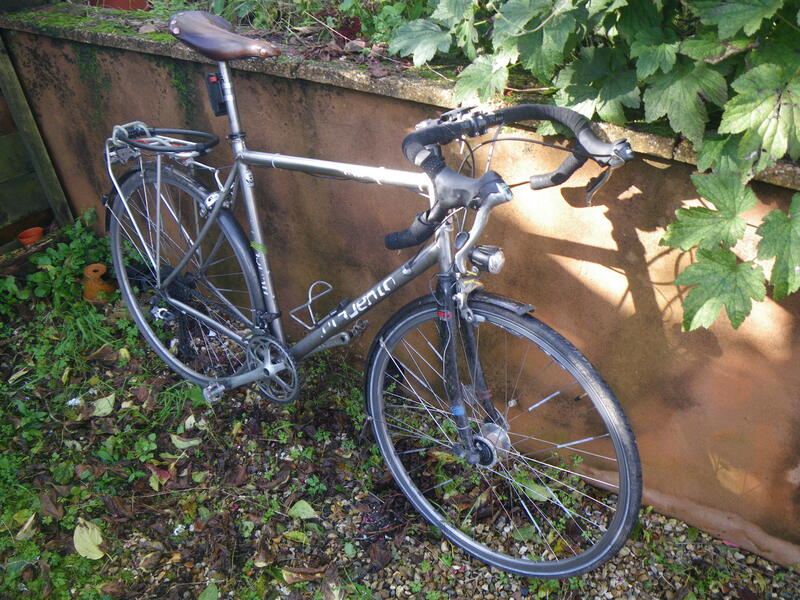 This is a proper audax type of bike and I have ridden a couple of proper long distance events on it. I would favour this bike for better roads and longer distance, if a lot of rain is expected. The wheels have cheap Ridga rims 32h front, 36h rear. Rear has a 105 hub. Spokes have 3m reflectors on them. The frame is custom Titanium. With bonus welded repairs. rack – just to carry all the necessary items. Works great with tents. That’s a dry bag bungee strapped onto it. The frame is steel and moderately heavy. Not super heavy, just strong. The Karate Monkey has a battery powered rear light fitted and if I am going out after dark I put a front battery light on. I am not planning to go vast distances on this. The furthest it’s been so far is a tiny 92km. The wide, heavy tyres are comfy but add some drag. For the uphills this is makes it a bit slower and tougher. On the downhills it’s top speed is lower. But to be honest, in the winter I don’t want to take muddy, wet downhill corners fast. I was surprised that it’s normal cruising speed on the flat is only a tiny bit lower than the Setavento. If it snows or is icey then this is the bike that will have the ice tyres on. I have some 35mm Schwalbe Marathon Winters in the garage ready to fit to keep riding in that kind of weather. The front wheel is a cheap 32h Ridga 29er wheel. The rear is a 36h Alfine with a welded Mavic 29er rim, maybe overkill! To sum it up, the Setvento is faster but the Karate Monkey feels more capable on poor road surfaces. Both are great bikes in their own way!